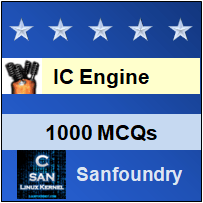 This set of IC Engines Multiple Choice Questions & Answers (MCQs) focuses on “Engine Efficiencies”. 1. The ratio of the heat equivalent to one kW hour to the heat in fuel per B.P. hour is termed as brake thermal efficiency. Explanation: Brake thermal efficiency is defined as the ratio of the heat equivalent to one kW hour to the heat in fuel per B.P. hour. Explanation: Overall efficiency is the ratio of the work obtained at the crankshaft in a given time to the energy supplied during the same time while mechanical efficiency is the ratio of the brake power to the indicated power and relative efficiency is the ratio of the indicated thermal efficiency to the air standard efficiency. Explanation: Mechanical efficiency is the ratio of the brake power to the indicated power and relative efficiency is the ratio of the indicated thermal efficiency to the air standard efficiency whereas overall efficiency is the ratio of the work obtained at the crankshaft in a given time to the energy supplied during the same time. Explanation: Relative efficiency is the ratio of the indicated thermal efficiency to the air standard efficiency whereas overall efficiency is the ratio of the work obtained at the crankshaft in a given time to the energy supplied during the same time and mechanical efficiency is the ratio of the brake power to the indicated power. Explanation: The brake thermal efficiency of the three given basic types of engines decreases in the order four stroke C.I. engine, four stroke S.I. engine, two stroke S.I. engine. Explanation: By increasing the pressure of intake air, the brake power of a diesel engine, keeping other parameters constant, can be increased and by no other means. 7. Which one of the following event would reduce volumetric efficiency of a vertical compression ignition engine? Explanation: Volumetric efficiency of a vertical compression ignition engine is reduced by closing inlet valve before bottom dead center. Explanation: In actual working, as compared to air standard cycle, the effect of variation in specific heats is to decrease maximum pressure and maximum temperature. Explanation: Volumetric efficiency is the ratio of the volume of charge admitted at N.T.P. to the swept volume of the piston while mechanical efficiency is the ratio of the brake power to the indicated power and relative efficiency is the ratio of the indicated thermal efficiency to the air standard efficiency whereas overall efficiency is the ratio of the work obtained at the crankshaft in a given time to the energy supplied during the same time. 10. The overall efficiency is defined as the ratio of the work obtained at the crankshaft in a given time to the energy supplied during the same time.